Philip Jennings returned to YAS after obtaining his degree and the post of Editor of the British Astronomical Association Journal. Philip appreciates the beauty of the moon so it was logical step to look at Selenology – the scientific study of the moon. Philip’s talk was fascinating and highlighted some key features using both photographs and his own observational drawings. Some other YAS lunar experts were later heard to comment that they had also learnt much. Both were reported on in detail in the mid November interim bulletin. 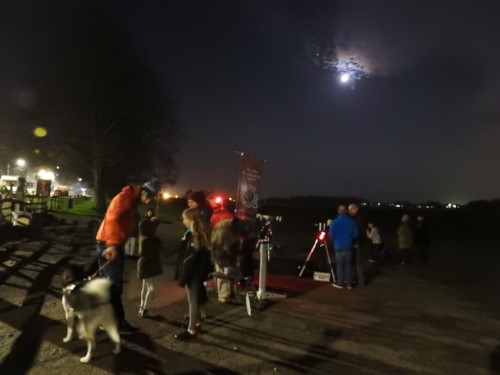 The night started clear and about 50 members of the public turned out with 6 scopes from YAS. It started to cloud over after about half an hour so Graham Moore and Malcolm Muncaster entertained with images on laptops etc. Stu described his early knowledge of the Solar System and its place within the Milky Way galaxy. Through a series of slides he explained how our knowledge of galaxies has changed. The incomprehensible number of galaxies now thought to exist within the known universe has grown in a very few years. He highlighted this little blue dot in an insignificant system of planets and moons orbiting a small star. One of billions of stars in one arm of a relatively small spiral galaxy, in amongst billions upon billions of other galaxies. The YAS photo competition finally had some entries on the topic of “People Doing Astronomy”. Unfortunately, Martin Dawson’s entry did not make it through the internet in time, so Neil Moss had a difficult job, choosing Suzanne Farmer’s photograph from the remaining entry. The topic of the next competition is “Comets”. Entries via Facebook or email please. This event was presented as a free guide to choosing a telescope. The informative talks by John Rowland, Gerry Fisher, Martin Whipp, Rupert Powell, Dave Armeson and Martin Dawson set up the attendees for some viewing under moderate conditions, which then misted over a little. The skies did eventually clear again, but unfortunately this was after most had gone home. We had 50 ticket bookings, but only about 50% of the customers turned up. We were probably competing with “Strictly”!. On behalf of the trustees and the committee, thank you to our presenters and all those who brought scopes or helped with chairs, front of house etc. Particular thanks are due to Marcus Grover and helper for supporting the event and for bringing a range of telescopes etc. for sale. Dave Armeson’s Christmas Lecture – MARS Rocks. This should be a fascinating look at the Red Planet and recent discoveries. David Friend is finalising the ‘plan’ for refurbishment of the observatory at Beetle Bank Farm. Each working party will be focussed on particular planned tasks for which volunteers are needed. David will be coordinating all aspects. If you are willing to identify yourself as a potential volunteer and have any relevant skills – carpentry, engineering, electrical and so on (even being willing to wield a hammer or turn a screwdriver may be useful) please contact David via email. Usual arrangement 7.00pm onwards. Scopes needed if you can make it. We have once again been contacted by Boothferry Primary School. Dave Armeson will give a talk for the pupils and parents as part of an event where pupils work on space is displayed. At a similar event last year, those of us who attended found the pupils to be attentive, knowledgeable and enthusiastic. If you are able to help out with a telescope I know that the pupils would be appreciative. Please contact by email to confirm your attendance. This is your chance to shine and tell us what you may have been doing, seeing, learning or photographing over the past year. There are likely to be some mince pies and other nibbles, possibly some drinks, maybe a better raffle and perhaps a surprise or two.